The turnout wasn't bad! I didn't remember to get a list of names at the beginning, but we had veterans Kevin, Oliver, Paul, Danny, John Juan (can't remember your real name!! ), Ryan, and Vern, as well as first-timers Paula (who got us started out on the right foot, led us to a park in Chinatown, and then unfortunately had to leave early), John, Genevive, Anne, Erin, and Jonathan. I know I'm forgetting some people - there were plenty of photos taken, so if someone will post some I'll fix the list to include everyone. 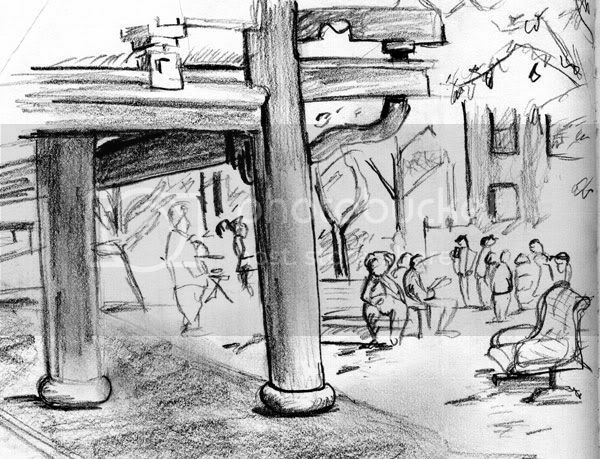 We met at Market, then walked up to a park in Chinatown and sketched there for a while. 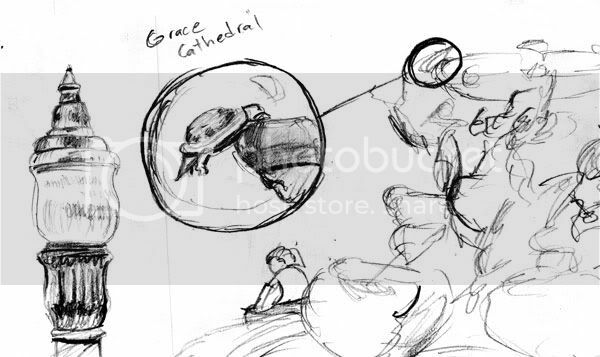 After that we went to the Grace cathedral, which apparently has a Peet's Coffee in the basement, and finished off at Union Square with a passing around of sketchbooks. There were a lot of great drawings, and in great volume. I'll scan some of my stuff to post tomorrow; I hope to see everyone else's drawings, too! Sorry I cut out on everyone soo quickly. I was getting burned by the sun pretty badly so I went off in search for a hat and what not. When I came back everyone was gone but it was cool because I was with two good friends so we walked around and had a fun time anyway. The only thing is that I'm nursing a sun burn right now. OUCH! Emma, it was great to see you and everyone else again. Sorry I didn't stick around too long. My name is just John like it says lol I'll be posting all of my drawings soon! I'm sorry I missed this time around! I'll be in SF tomorrow around Civic Center and I'll post what I get. I'm looking forward to everyone else's contributions! John, I'm glad you guys had a good time on your own... sorry to have abandoned you! I'll have to keep better track next time. Genevieve and Anne drawing in chinatown. This was a really fun crawl with some pretty varied locations. The people watching in Chinatown alone was spectacular. My favorites characters there were the newspaper vendors, the old men clustered playing card and board games, and the guy selling watches of dubious origins. Great find on the park Paula! I love that coat rack sketch Emma, it encapsulates a lot of the mothers there. Upper deck of the Chinatown park. Part of a fountain and a lamppost in the park across from Grace Cathedral. Some dude hocking his paintings at Union Square. 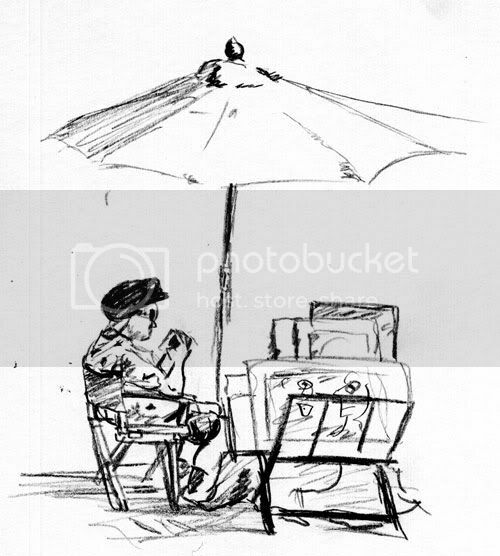 Ah, artists drawing artists. forgive me for not even checking in last night ... but I was stuck in an editorial office, from 9 to 6, drawing a mile a minute ... Ronnie was in the same situation ... a very busy saturday. But it's great to see your sketches. Very nice ! 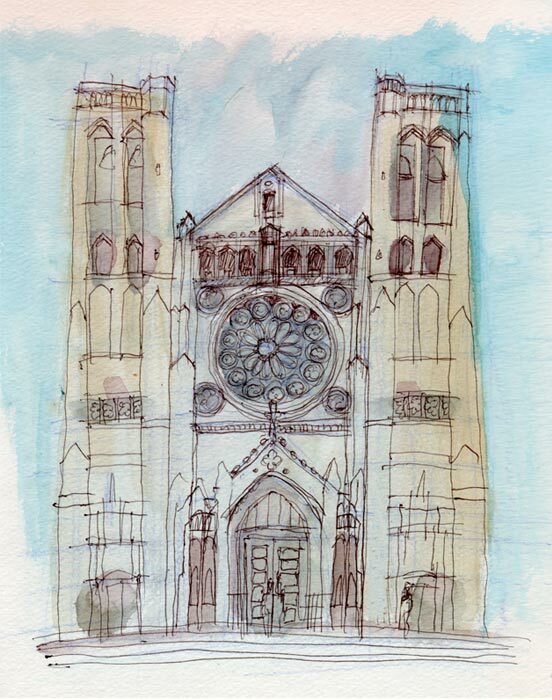 I kinda ran out of time drawing the Grace Cathedral. The walk up the hill just about killed me. For those of you that don't know San Francisco, it was so steep that there were handrails on the sidewalk! Although, when we got to the top, what a view! It was well worth it. I enjoyed this 2 hour sketch even as the neighborhood got super friendly with me on the park bench. Especially the panhandlers. It was a lot of fun to meet everyone again. Here's some quick group photos. Although it was the start of a four day weekend (Independence Day holidays), there was a fair showing. Taking a breather at the Chinatown playground. Ann is not pictured because she's taking the photo. Thanks Ann. See how much fun we have. Don't you wish you were here too? Emma - really like mom the coatrack, and the kids! I think that park may have had the most kids in one place I've ever scene in SF. Ryan - you nailed that Union Square art scene. Last edited by frosti on Mon Jul 03, 2006 2:52 pm, edited 1 time in total. these are nice and beautiful sketches! many sketcher gather this time too!! I want to go to SFSC!! Here's my efforts for the day. I'm trying out toned papers, and trying to break out of some of my habits (like just using 1 pen all the time). In Portsmouth Square, in China town, they had an awesome little play area, which had this little stone lion's face. I've got a ways to go with architecture, but I really liked these figurative statues on top of the one building. Scale gets funny in parks, but I think this one might be my best of the day. An elderly fellow walking about. 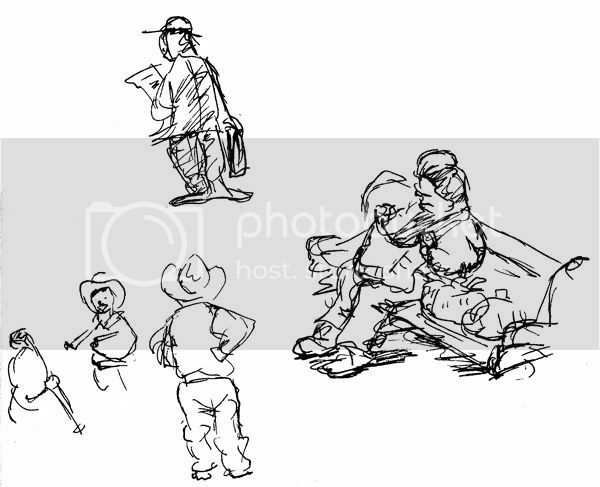 The park was densley packed, though you couldn't tell from my sketches. Lots of kids, old folks, and people doing Tai Chi. A girl reading out loud. Playing with the brush pen and the roof of the restrooms. That was all I got in China town, aside from a slight sunburn On the way up Bush street, we went to Huntington Square, which stands in the middle of Grace Cathedral, the Grand Masonic Temple, some nice apartments, and a too ritzy for me private club. Naturally, I drew none of these. I did find a dad packing up his picnic. Then I settled on a fae's-eye view of the park. I tried to get lower, but I couldn't draw from there. So then, off to Yerba Buena, er, nah, let's hit Union Square - there's a whole giant crowd of artists! I didn't draw any of them, either. This first one would benefit from some tone - that's an electrical outlet next to the base of a tree. The pidgeons know about the falsies. In general though, they seem puzzled. The ferns in the planters boxen have seen better days. They create interesting spaces though. In general, I find that the sketchcrawls inspire me enough to want to be drawing all the time. Especially after seeing everyone elses stuff. I'm looking forward to SC11 ! I had a lot of fun this time around; catching up with old faces (and sketchbooks) as well as quite a few new ones. Emma: Awesome stuff as always! 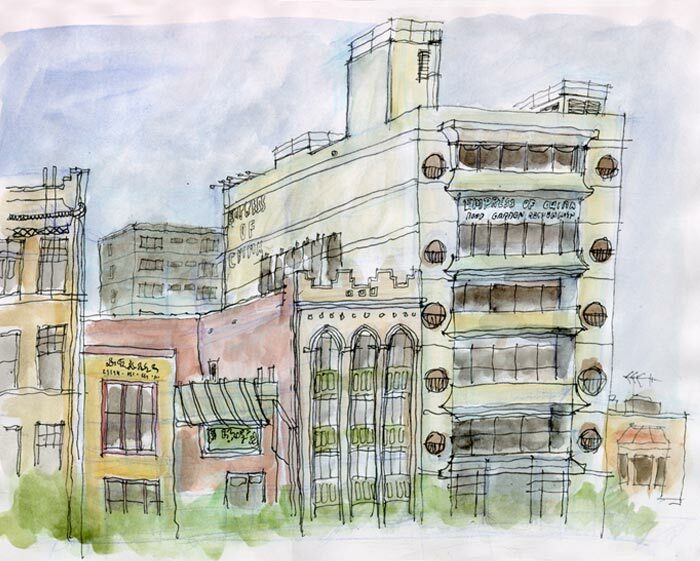 I really like your carefully expressive figures and buildings. 2DAnimator: Wow...very detailed and studied masonry, facades and buildings. Some of my own stuff...mostly from the China Town leg of the Crawl! Last edited by Oliver on Sat Jul 08, 2006 9:30 pm, edited 5 times in total.